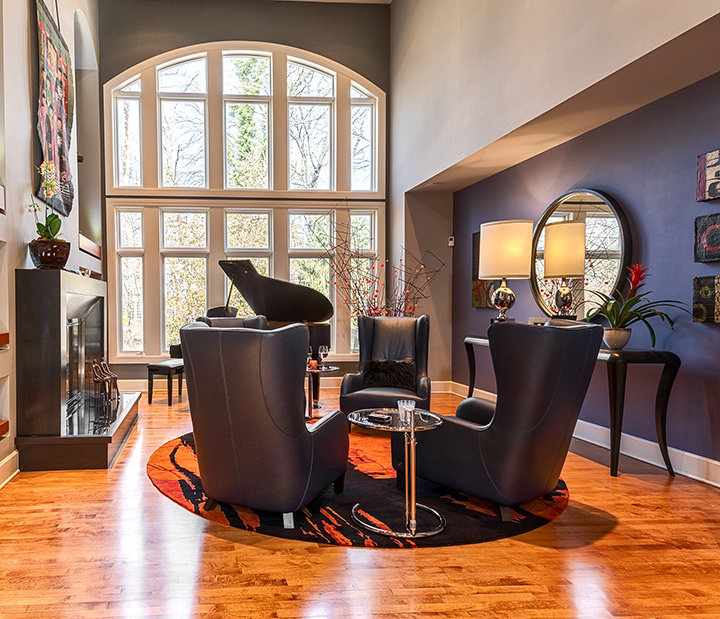 A comprehensive remodel takes a spec home in Ladue from run-of-the-mill to remarkable. 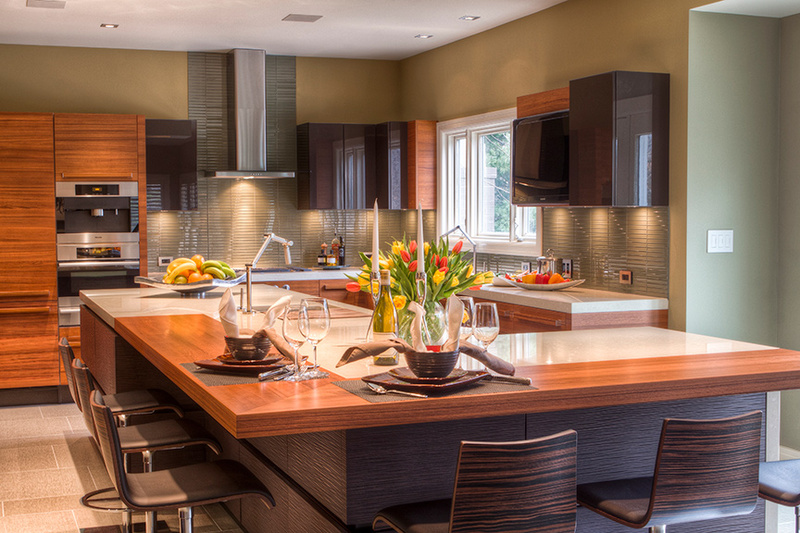 “My passion is bringing out the best in the floor plan,” says Peg Hammerschmidt, interior architect at Hammer & Schmidt Design. And while the homeowner describes her house’s original style as bland – “builder-grade late-90s contemporary,” she says – the catalyst for a stunning whole-house transformation was closet space, not aesthetic. 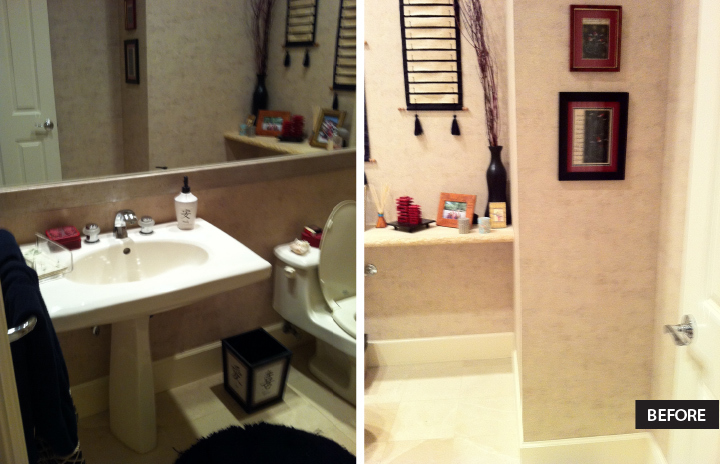 “The closets in the master bedroom were too small,” the homeowner begins. 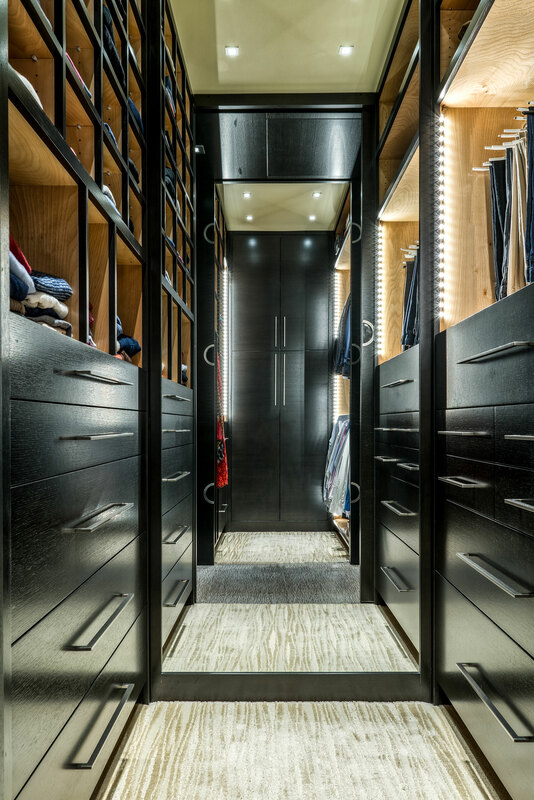 Two tiny walk-ins were expanded into a large, custom-designed unit featuring Touchless cabinetry, overhead lighting and plenty of built-in shoe racks, too. 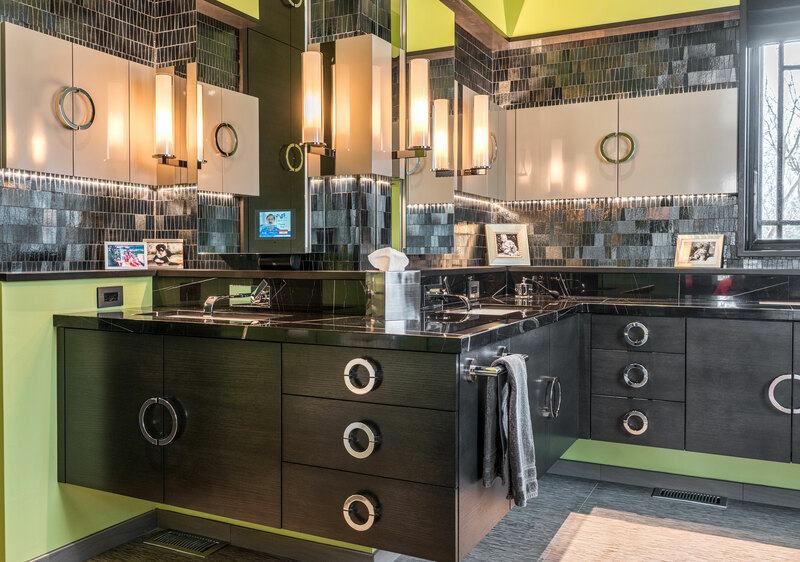 Fabricated by Classic Woodworking, espresso wood continues into the master bathroom, where Hammerschmidt designed a wrap-around, zigzag vanity with eye-catching chrome pulls designed to pop against mosaic glass tile walls and heated monolithic flooring. 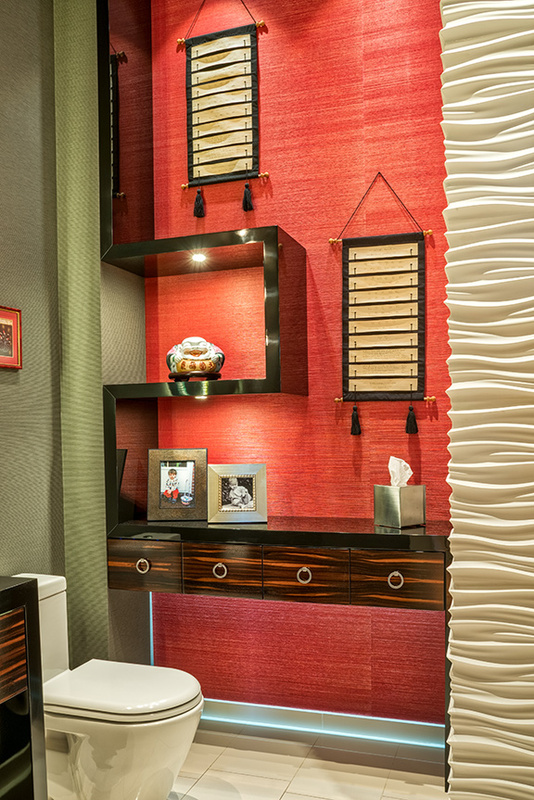 You’ll notice some subtle Asian influences in the master suite — and those elegant touches trickle down to the kitchen, where Italian teak perimeter cabinets set the tone for a contemporary look made complete with tall, dark and textured wall units and a glistening glass tile backsplash. 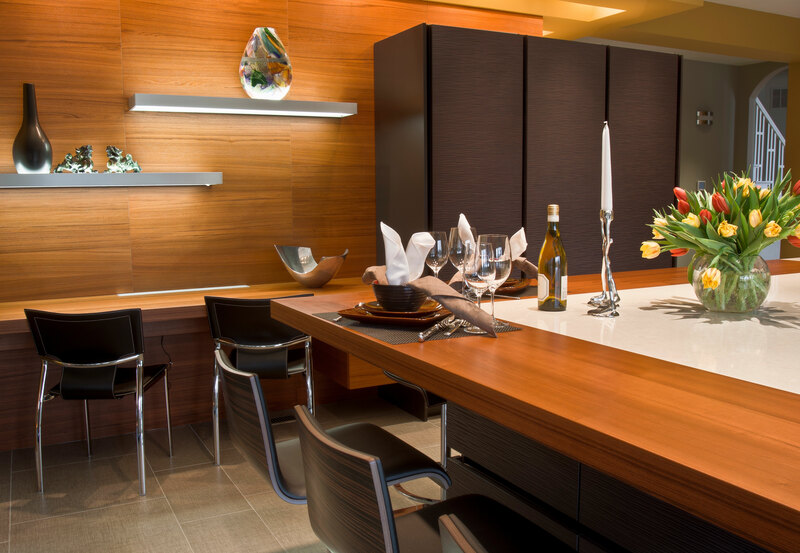 Hammerschmidt describes the kitchen’s initial layout as “traditional and boring.” She started by opening up the room; with less drywall there was plenty of space for an expansive L-shaped island topped with Caesarstone quartz and teak counters, which are anchored by built-in cupboards and a hidden wine cooler. 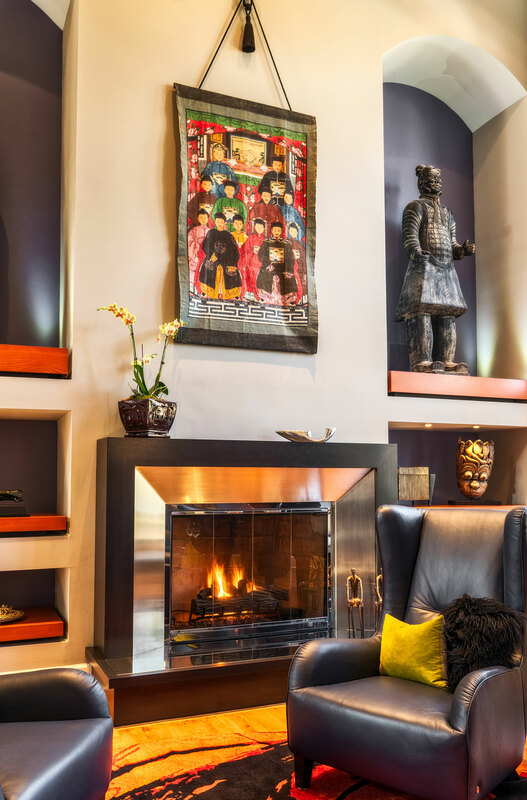 There was more to tweak in the living room, where a basic fireplace with a standard façade was redone into a brag-worthy hearth bordered by polished stainless steel and backlit niches — additional focal points for displaying art amassed during world travel. 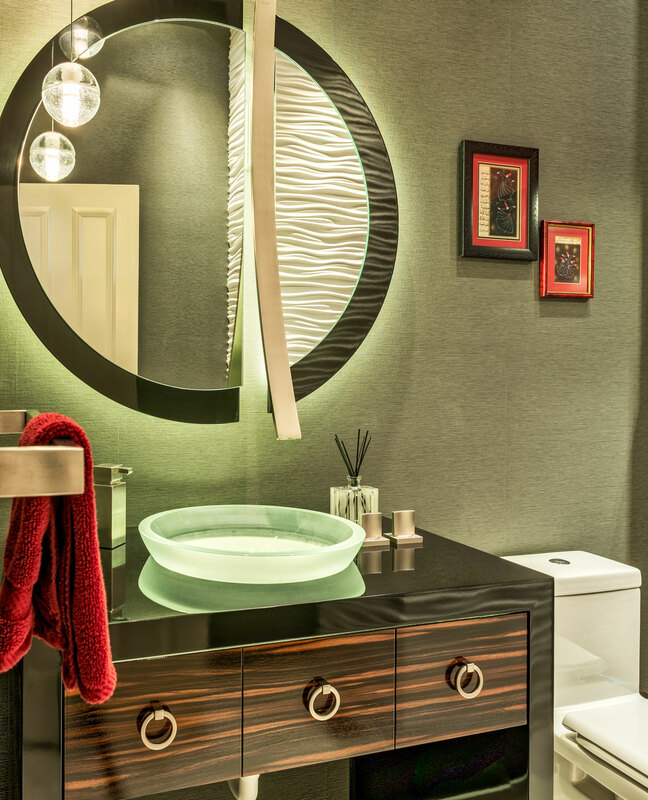 The home’s ultramodern Eastern theme peaks in the powder room, where Hammerschmidt designed a stunning, sculptural sink with a faucet that bursts right through the mirror. Portions of an extensive art collection are shown on a brilliant and asymmetrical display area facing the under-lit glass sink. An overarching goal of the project was to produce a series of spaces so luxurious the homeowners would feel like they were on vacation while in the comfort of their own home — “And we sure do feel that way,” says the homeowner.